The old chestnut, “Enough about me, let’s talk about you . . . what do you think about me?’’ could be the subtitle of the “Autobiography of Mark Twain.’’ The first author in history to plan and actualize a new publication a century after his death, Mark Twain must be cackling with glee a few degrees south of Captain Stormfield’s heaven right now: Volume I of the work will be arriving in time for the anniversary of Twain’s 175th birthday on Nov. 30, with volumes II and III to follow over the next five years. The entire collection will total in excess of a half a million words and some 5,000 pages. While it is clearly a product of the 19th century, the book anticipates the contemporary memoir in form and in its attitude toward objectivity. It eschews simple chronological order, opting instead to follow Twain’s own internal logic, and Twain makes clear that this book is a product of memory, not a history. Beyond all that, despite its daunting heft, the work provides distinct pleasures for even the casual Twain fan. For the next 35 years Twain would complete over 30 entries, but could not sustain this rate of progress on the project beyond that point. Small wonder, considering his other endeavors at the time. Possessed with an almost otherworldly energy level, Twain wrote in excess of 50,000 letters, more than 3,000 newspaper and magazine articles, and more than 30 books. With all this activity, it was not until December 1906, approximately three and a half years before his death at age 74, that he was finally ready to sit down long enough to reflect on his life and work and follow a regular daily schedule of dictations. By December 1909 when he completed the final chapter — a moving eulogy of his youngest daughter, Jean, a severe epileptic who died of heart failure — he had dictated more than 250 daily entries. After wading through all 467 pages of volume I, not counting the appendixes, what then does the “Autobiography’’ hold for the interested reader? Simply put, some marvelous writing. Volume I begins with “The Tennessee Land,’’ where Twain discusses his father’s doomed legacy of 75 acres — “he laid the heavy curse of prospective wealth upon our shoulders’’ — and concludes with his March 30, 1900, diatribe about the 25th and 26th presidents — “the McKinleys and the Roosevelts . . . have quite completely transformed our people from a nation with pretty high and respectable ideals to just the opposite of that.’’ The highlights include “The [General] Grant Dictations,’’ “Four Sketches About Vienna,’’ “Something About Doctors,’’ “My Autobiography [Random Extracts from It],’’ detailing his genealogy and his early years on the Quarles’s farm, his searing story about the death of his favorite daughter, Susy, and his warm recounting of her biography about him written at age 13. But how do we judge the veracity of Twain’s accounts from this distance in time? Or is it even necessary? That’s where the fun begins. 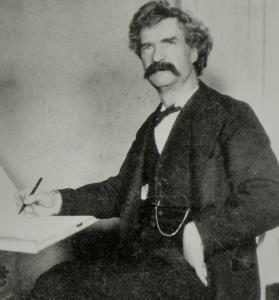 Twain was obviously legacy building here and decidedly uninterested in making any Rousseau “Confessions.’’ While the book’s editor recognizes that his “longstanding plan was to speak as truthfully as possible ‘from the grave,’ ’’ Twain made it clear to an interviewer in 1899 that a “man cannot tell the whole truth about himself, even if convinced that what he wrote would never be seen by others.’’ So it remains to the reader to determine Twain’s “dimensional difference between a fact and a surmise,’’ and comfortably seated in a good light with reading glasses adjusted, enjoy reading the prose of a unique and treasured American voice and one of the world’s greatest writers who is presenting himself in a manner that entertains as well as informs. Laura Skandera Trombley is president of Pitzer College and author of the recently published “Mark Twain’s Other Woman: The Hidden Story of His Final Years.’’ She can be reached at president@pitzer.edu.